MIGUELA DAVID STOWE Miguela David Stowe, known to many by her nickname Mike, passed away at her daughter's home in Waimanalo at the age of 91, on Sunday, August 23, 2015 with her family at her side. 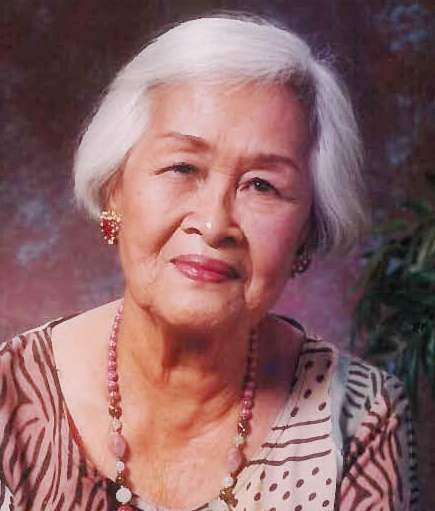 Born on September 29, 1923 in Bulacan, Philippines to Leonardo Talla David and Carmen Juco David she was the sixth of seven children. She came to live on Oahu in 1949. Mike worked at Wigwam in the Jewelry department and later for Hilo Hattie's where she retired after 20 years of service. She enjoyed helping people and made many friends in and out of her career. It was once said by one of her customers, "she could sell you anything". Mike was a kind, caring and generous person who would give her last dollar to someone in need. She loved to sing and dance and the highlight of her life was family. She always remarked, "Family is Important. Others will come and go, but family will always be there for you". Mike is survived by daughters, Pat Mellick Rutkowski, twins, Kathy Mitchell and Christine M. DeTommaso, son Michael (Gina) Mellick, 6 grandchildren, Tracy (Wendy), Nicole (Kris), Michelle (Adam), Christopher (Rhoda), David, Keisha, 6 great grandchildren Chelsie, twins Keala and Hoku, Hunter, Harley, Haiden, great-great grandson, Dawson and the two she cared for everyday and treated like grandsons, Kala and Rocko, her favorite dogs. Visitation will begin at 10:00 am at Star of the Sea Church in Kahala on Saturday, October 3, 2015. Mass at 11:00 am, lunch to follow.